Test case is a PHP class containing test methods. See phpunit.de/manual for more information about PHPUnit tests. By default, Test Explorer looks for script files suffixed with Test.php, containing a class suffixed with Test and extending base test case class. 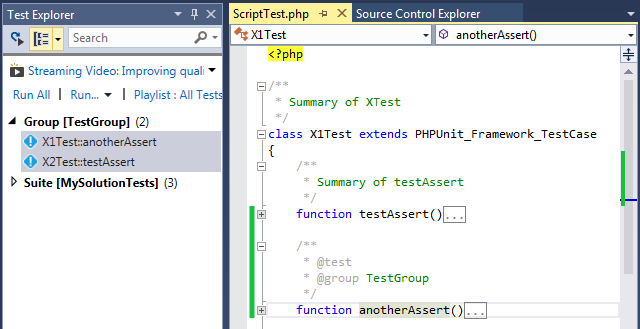 Any public function within the test class prefixed with test (lowercased) or annotated with PHPDoc keyword @test is listed in the Test Explorer window. Note: script files have to be saved to reflect changes in the Test Explorer window.